Relationships after Zanis et al. (2002, 2003) and Qiu et al. (1999). 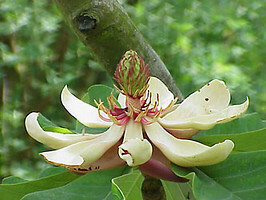 The magnoliid clade contains several thousand (~8500) species divided into 20 families, including several large, economically important families such as Magnoliaceae, Lauraceae, Piperaceae, and Annonaceae. Members of the magnoliid clade are widespread throughout tropical and temperate areas of the world and can be large trees, shrubs, vines, lianas, and occasionally herbs (Judd et al., 2002; D. Soltis et al., 2005). Economically important products derived from magnoliids include edible fruits, such as avocados (Persea americana) and guanabana, sour sop, cherimoya, and sweet sop (Annona spp.). Magnoliid species are also the source of spices (Judd et al., 2002; D. Soltis et al., 2005) such as black and white pepper (Piper nigrum), bay leaves (Laurus nigrus), nutmeg (Myristica fragrans), cinnamon (Cinnamomum verum), and camphor (Cinnamomum camphora). 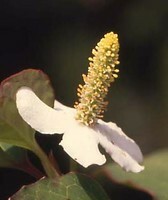 Other members are used as ornamentals or timber (e.g., Magnolia and Liriodendron; Judd et al., 2002; D. Soltis et al., 2005). The magnoliid clade contains most of those lineages that were typically referred to as "primitive angiosperms" in earlier classification schemes (e.g., Cronquist, 1981, 1988; Stebbins, 1974; Takhtajan, 1997); most of these "primitive" species have long, broad, net-veined leaves and large flowers with numerous, spirally arranged tepals (perianth parts that are not differentiated into petals and sepals), stamens, and carpels. 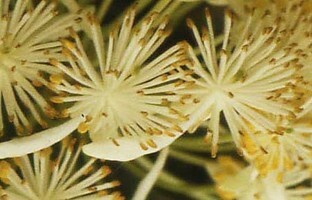 Some also have leaf-like, or "laminar," stamens. However, while these classification systems (for example Cronquist's subclass Magnoliidae) united some of the families that are currently circumscribed as magnoliids, phylogenetic analyses have shown that these previous classifications also included groups that are unrelated to the magnoliid clade, such as Amborella and Austrobaileyales. Moreover, these classifications also excluded members, such as Lactoris, that were difficult to place in the magnoliids because the group is very old (some hypothesized members, such as Archaeanthus (Dilcher and Crane 1984) date to the early Cretaceous) and extinction has likely obscured many of the evolutionary relationships (see Soltis et al 2005). The major lineages of magnoliids were first identified in studies using DNA evidence (e.g., P. Soltis et al., 1999); however the composition of the magnoliid clade and relationships among the members did not become clear until data sets of at least five genes for a broad sample of taxa were assembled to address these problems (e.g., Qiu et al., 1999, 2000; Zanis et al., 2002). Several possible morphological characteristics have now been identified that may unite magnoliids. 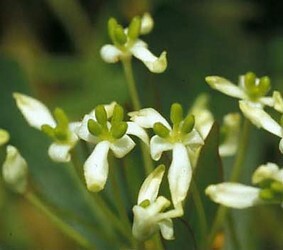 Some (although obscure) possible synapomorphies (shared, derived characteristics) include entire leaf margins, extrorse anthers, ephemeral antipodal cells, the presence of hypostase, the presence of a nucellar cap, and raphal bundle branches at the chalaza (Angiosperm Phylogeny Website, 2005). Within the magnoliids, researchers have identified four evolutionary lineages and clarified their evolutionary relationships: Magnoliales and Laurales are sisters, and Piperales and Canellales are sisters. The circumscription of these orders and their interrelationships had not been proposed previously based on morphology alone. Magnoliales. 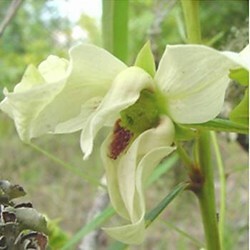 Based on molecular analyses, this group includes six families (Myristicaceae, Degeneriaceae, Himantandraceae, Magnoliaceae, Eupomatiaceae, and Annonaceae), relationships among which are now clear (e.g., Sauquet et al., 2003). This same clade also emerged in the nonmolecular analysis of Doyle and Endress (2000). Apparent synapomorphies for the clade include reduced fiber pit borders, stratified phloem, an adaxial plate of vascular tissue in the petiole, palisade parenchyma, asterosclereids in the leaf mesophyll, continuous tectum in the pollen, and multiplicative testa in the seed (Doyle and Endress, 2000). Furthermore, all members of this clade examined to date have a characteristic deletion in their Apetala3 gene (Kim et al., 2004a). Magnolia tripetala, a member of Magnoliaceae (photo © Kurt Stuber), and Eupomatia benettii, a representative of Epomatiaceae (photo © Peter Endress). Laurales. Laurales, as currently circumscribed (APG II, 2003; see Renner, 1999), include seven families: Calycanthaceae (including Idiospermaceae), Monimiaceae, Gomortegaceae, Atherospermataceae, Lauraceae, Siparunaceae, and Hernandiaceae. In previous classifications (e.g., Cronquist, 1981, 1988), Amborellaceae and Trimeniaceae were occasionally placed in Laurales; and in fact, both Amborella and Trimenia have even been considered part of Monimiaceae (Perkins, 1925; see Angiosperms for a discussion of the placement of these families). Chloranthaceae have also occasionally been placed in Laurales (e.g., Takhtajan, 1987, 1997; Thorne, 1974; see Angiosperms for a discussion of its placement). 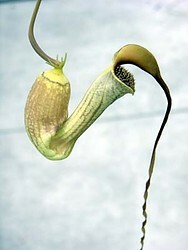 Laurales are united by a perigynous flower in which the gynoecium is frequently deeply embedded in a fleshy receptacle (Endress and Igersheim, 1997; Renner, 1999). Other apparent non-DNA synapomorphies include the presence of inner staminodia, ascendant ovules, and tracheidal endotesta (Doyle and Endress, 2000). 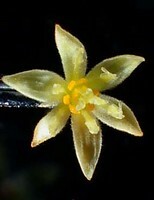 Photo of Persea americana, a representative of Lauraceae (photo © Matyas Buzgo). Piperales. Previous circumscriptions of Piperales have varied (e.g., Dahlgren, 1980; Cronquist, 1981, 1988; Takhtajan, 1987, 1997; Thorne, 1992; Heywood, 1993), but molecular studies clearly united Aristolochiaceae, Lactoridaceae, Piperaceae, and Saururaceae (e.g., Qiu et al., 1999; P. Soltis et al., 1999; Barkman et al., 2000; D. Soltis et al., 2000; Zanis et al., 2002). In addition, recent studies have placed Hydnoraceae, a family of parasitic plants often placed in Rosidae (e.g., Cronquist, 1981; Heywood, 1993), within Piperales, although the exact position is not certain (Nickrent et al., 2002). Although not recognized as a group prior to molecular analyses, a number of morphological synapomorphies have been identified: distichous phyllotaxis, a single prophyll, and oil cells (Doyle and Endress, 2000). The flower of Aristolochia sprucei, a representative of Aristolochiaceae (photo © Mario Blanco), the inflorescence of Piper capense, in the Piperaceae (photo © Matyas Buzgo), and the inflorescence of Houttuynia cordata, a representative of Saururaceae (photo © Matyas Buzgo). Canellales. The relationship of Canellaceae and Winteraceae has been strongly supported in all multigene analyses (e.g., Qiu et al., 1999; P. Soltis et al., 1999; D. Soltis et al., 2000; Zanis et al., 2002, 2003), and the clade was also obtained in Doyle and Endress's (2000) nonmolecular analysis. However, these two families have not typically been considered closely related to each other, and neither was suspected of being related to any members of Piperales. For example, Winteraceae have often been considered a close relative of Magnoliaceae (e.g., Cronquist, 1981, 1988; Heywood, 1993), with Canellaceae close to Myristicaceae (e.g., Wilson, 1966; Cronquist, 1981, 1988). Furthermore, intuitive classification systems regarded Winteraceae as perhaps the "most primitive" extant family of angiosperms (Cronquist, 1981; Endress, 1986). The phylogenetic position of Winteraceae clearly indicates that the vesselless xylem and plicate carpels found in members of the family are secondarily derived (see also Young, 1981). Possible synapomorphies for Canellales are a well-differentiated pollen tube transmitting tissue, an outer integument with only two to four cell layers, and seeds with a palisade exotesta (Doyle and Endress, 2000). Additional synapomorphies may include an irregular "first-rank" leaf venation (Hickey and Wolf, 1975; Doyle and Endress, 2000), features of stelar and nodal structure (Keating, 2000), and vascularization of the seeds (Deroin, 2000). 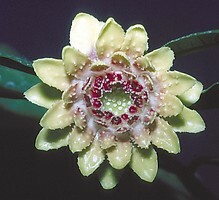 The male inflorescence of Tasmannia stipitata (photo © Matyas Buzgo), a representative of Winteraceae. Deroin, T. 2000. Notes on the vascular anatomy of the fruit of Takhtajania (Winteraceae) and its interpretation. Annals of the Missouri Botanical Garden 87: 398-406. Endress, P. K. 1986. Reproductive structures and phylogenetic significance of extant primitive angiosperms. Plant Systematic Evolution 152: 1-28. Keating, R. C. 2000. Anatomy of the young vegetative shoot of Takhtajania perrieri (Winteraceae). Annals of the Missouri Botanical Garden 87: 335-346. The Myristicaceae Pages. John Janovic, Manoj Mistry, and Roosevelt García Villacorta. Page: Tree of Life magnoliids. Authored by Pam Soltis, Doug Soltis, and Christine Edwards. The TEXT of this page is licensed under the Creative Commons Attribution License - Version 3.0. Note that images and other media featured on this page are each governed by their own license, and they may or may not be available for reuse. Click on an image or a media link to access the media data window, which provides the relevant licensing information. For the general terms and conditions of ToL material reuse and redistribution, please see the Tree of Life Copyright Policies.